You can search within all of the metrics in your account using targeted search terms. Metrics are returned that have matching results within their namespace, metric name, or dimensions. In the search field on the All metrics tab, enter a search term, such as a metric name, namespace, dimension name or value, or resource name. This shows you all of the namespaces with metrics with this search term. For example, if you search for volume, this shows the namespaces that contain metrics with this term in their name. 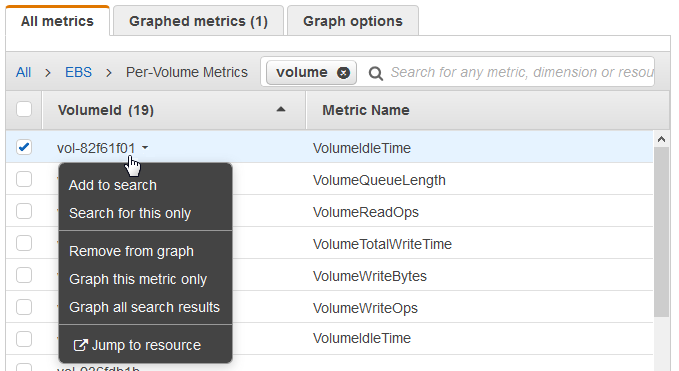 To graph one or more metrics, select the check box next to each metric. To select all metrics, select the check box in the heading row of the table. To refine your search, hover over a metric name and choose Add to search or Search for this only. To view one of the resources on its console, choose the resource ID and then choose Jump to resource. To view help for a metric, select the metric name and choose What is this?. The selected metrics appear on the graph. (Optional) Select one of the buttons in the search bar to edit that part of the search term.